This is the Antikythera Mechanism, and it’s the oldest computer on Earth, discovered over a century ago in a shipwreck off Crete, and built in the 2nd century BC. We have only now learned about what it is, what it’s for, and what it does through high-resolution computer imagery and three-dimensional X-ray tomography. Reports earlier this year confirmed that it was an astronomical calendar; now we know the full capacities of this machine, perhaps the most sophisticated gear-based mechanism in human history before 18th-century clockworks. 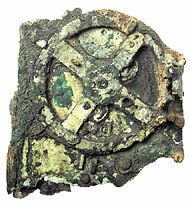 After a closer examination of the Antikythera Mechanism, a surviving marvel of ancient Greek technology, scientists have found that the device not only predicted solar eclipses but also organized the calendar in the four-year cycles of the Olympiad, forerunner of the modern Olympic Games. Archimedes, who lived in Syracuse and died in 212 B.C., invented a planetarium calculating motions of the Moon and the known planets and wrote a lost manuscript on astronomical mechanisms. Some evidence had previously linked the complex device of gears and dials to the island of Rhodes and the astronomer Hipparchos, who had made a study of irregularities in the Moon’s orbital course. The new findings, reported Wednesday in the journal Nature, also suggested that the mechanism’s concept originated in the colonies of Corinth, possibly Syracuse, in Sicily. The scientists said this implied a likely connection with the great Archimedes. Read more from the Times here. What’s Happening in Sierra Leone? Granted, it’s not a question that occupies a great deal of attention, but Travel Dynamics International likes to illuminate parts of the world that don’t get a lot of attention. Last April, we were in Freetown (and we will be again, next April). We frequently arrange to have our guests meet local government officials; on this voyage, we were privileged to meet the Deputy Chief of Mission for the US Embassy, Elizabeth Susie Pratt, who gave us this excellent summary of the current political and social issues of Sierra Leone, and that African country’s ties to the United States. The address is featured prominently on the American Embassy’s website. Good morning ladies and gentlemen. I am pleased to be the first to welcome you to Sierra Leone. I have been the Deputy Chief of Mission at the US Embassy to Sierra Leone for nearly two years now, so I welcome you as I am preparing for my own departure. My time here has been one of exciting changes both in the Embassy and in the country as a whole. Our Embassy moved from our longtime home to a new building up on top of Leicester Peak. Sierra Leone has transitioned from being a country only just emerged from war, with a peace still guarded by a robust UN force, to a reconstructing nation, with a rapidly reducing UN presence, and a democratic election and peaceful civilian to civilian transfer of authority complete. I think it is important, however, to begin any discussion of U.S.-Sierra Leone relations with a discussion of the historical ties that connect the two countries. The first major contact between America and Sierra Leone was through the slave trade. Captives from this part of Africa were highly sought after for their superior rice-growing abilities. The rice from this part of the world was among the best, and rice was a prime industry in the Carolinas and Georgia. Many Sierra Leoneans found their way to the United States because plantation owners sought them out. Their expertise was invaluable in the southern economy. The Antarctic Peninsula will likely look different when we return to it this December-February, on our cruises aboard Corinthian II. AFP is reporting that Wilkins Ice Shelf is “hanging by its last thread” to Charcot Island, one of the plate’s key anchors to the Antarctic peninsula. “Since the connection to the island… helps stabilise the ice shelf, it is likely the breakup of the bridge will put the remainder of the ice shelf at risk,” a press release from the European Space Agency (ESA) said. Wilkins Ice Shelf had been stable for most of the last century, covering around 16,000 square kilometres (6,000 square miles), or about the size of Northern Ireland, before it began to retreat in the 1990s. Since then several large areas have broken away, and two big breakoffs this year left only a narrow ice bridge about 2.7 kilometres (1.7 miles) wide to connect the shelf to Charcot and nearby Latady Island. The latest images, taken by Envisat’s radar, say fractures have now opened up in this bridge and adjacent areas of the plate are disintegrating, creating large icebergs. Scientists are puzzled and concerned by the event, ESA added. The Antarctic peninsula — the tongue of land that juts northward from the white continent towards South America — has had one of the highest rates of warming anywhere in the world in recent decades. But this latest stage of the breakup occurred during the Southern Hemisphere’s winter, when atmospheric temperatures are at their lowest. One idea is that warmer water from the Southern Ocean is reaching the underside of the ice shelf and thinning it rapidly from underneath. “Wilkins Ice Shelf is the most recent in a long, and growing, list of ice shelves on the Antarctic Peninsula that are responding to the rapid warming that has occurred in this area over the last fifty years,” researcher David Vaughan of the British Antarctic Survey (BAS) said. In the past three decades, six Antarctic ice shelves have collapsed completely — Prince Gustav Channel, Larsen Inlet, Larsen A, Larsen B, Wordie, Muller and the Jones Ice Shelf. The above images show the partial collapse of Wilkins Ice Shelf in late February/March, 2008; a chunk of ice seven times the size of Manhattan broke off during this event. Considering that Antarctica is now experiencing winter, it is highly unlikely Wilkins will survive in the Antarctic summer. And sometimes they’re just telling the truth. 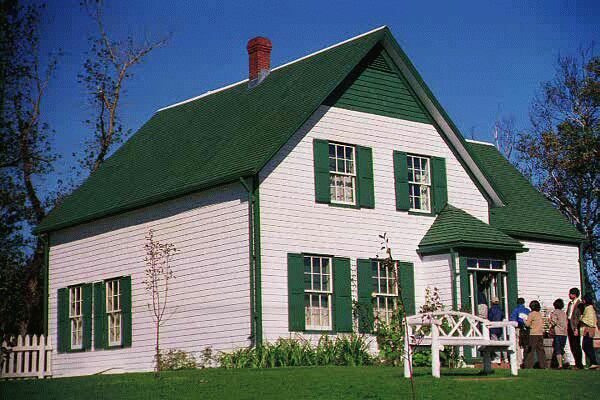 And this is the House of Green Gables. Nearly always, imagination comes first for Anne: before social expectations, before conventional romantic customs, and even before her gender’s storied instinct to please and reassure. Because she is starved for human love, her primary attachment is to the natural world. As she approaches Green Gables for the first time with Matthew, she excitedly renames the landscape around her, dubbing a neighbor’s pond “The Lake of Shining Waters” and transforming a prosaic “avenue” into “The White Way of Delight.” In doing so, she reclaims the great, definitive Adamic prerogative: to name the world. Nature, as Montgomery portrays it, enables children to experience autonomy and mystery as they can nowhere else. Each nook of shadows in a sun-striated field holds the promise of esoteric knowledge: “Below the garden a green field lush with clover sloped down to the hollow where the brook ran and where scores of white birches grew, upspringing airily out of an undergrowth suggestive of delightful possibilities in ferns and mosses and woodsy things.” In Anne’s eyes, the woods and fields of Avonlea become a half-world of fantasy, fairy tales, and chivalric poetry, where ghosts roam the woods between her house and her friend Diana’s or where a flat can become Elaine’s tragic barge en route to Camelot. Indeed, Anne’s relationship to nature is almost pagan, steeped in the sensual. Anne, for her milieu, is one weird sister. A weird sister, perhaps, but certainly that’s why her home on PEI remains one of the top tourist attractions in all of Canada. Read the full article here, and come with us to Canada to recapture the romantic imaginations of our childhoods. As promised, Conde Nast Traveler is now featuring its superb article on TDI’s Antarctica trip, “Love in a Cold Climate,” on its website. Click above for the full text. Just the thing to chill you out on this steamy New York evening. Later this month, Delta Air Lines customers will be able to avoid long security lines at Los Angeles International Airport by enrolling in a national program that provides priority lanes in passenger terminals. In the first operation of its type at LAX, the Clear fast-pass system — using fingerprint and eye scanners — is designed to identify travelers and get them through Transportation Security Administration checkpoints in a matter of minutes. “Just to know you can get to the airport at a decent time, go through security and make your flight is something you can’t put a value on,” said Bryan Martinez, 37, of Thousand Oaks, a marketing executive for Amgen Inc. who has used the Clear system for several years at other airports. More from the LA Times here.